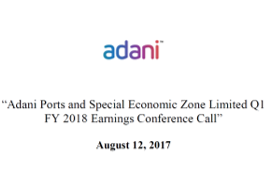 APSEZ (Adani Ports and Special Economic Zone) handled cargo volume of 44 million ton in quarter 1 of FY18. Additionally, ABPO Australia 6 million ton of coal. Mundra which handles more than 1 million TEU for the first time in a quarter and it is likely to become the largest container port operator in India in FY18. APSEZ achieved this increased market share by commissioning container terminal port and adding five new shipping lines across Mundra and Hazira. Looking ahead in FY18, APSEZ expects to containerize more cargo and gain further market share. The incremental container volume will be handled from Ennore which was commissioned in June 2017 and company expects thefirst vessel to call the port in September. In FY18, coal volumes are expected to grow by 5%, this is on the basis of company’s long-term contract with Reliance for 2 million tons each at Hazira and Dahej. Compared to Q1 FY 16-17, Company’s consolidated operating revenue in Q1 FY17-18 grew by 50%, EBITDA grew by 37% and profit before tax grew by 24%. The total operating income has grown by 50% to 2745 Crores. The total operating income which is relating to the ports and the logistics and also the SEZ has grown by 29% to 2364 Crores. Port revenues are up 7% up to 1742 Crores and port’s EBITDA excluding FOREX is 1255 Crores which is am 8% growth. Company will be improving the Port EBITDA margins by minimum of 100 basis points year-on-year. EBITDA has grown by 31% to 1598 Crores and thecompany stands at 68% EBITDA margins. PAT for the quarter stands at INR 702 Crores. Income from ABPO business in Australia was INR 99 Crores and EBITDA was INR 17 Crores. Company expecting 30% to 35% revenue growth in thelogistics business. In terms of ports EBITDA margin, thecompany expects at least 100 basis points increase in margin on account of higher capacity utilization, technology initiative and cost efficiencies. EBITDA margins are based on EXIM and domestic volume. Also, the recently started Kila Raipur in Punjab is responsible for volatility. The company will continue to focus on reduction of CAPEX, debt, and ensure higher free cash flow in FY18. The profit after tax because of Mundra hitting the full taxation regime from this quarter and from this year onwards stands at 702 Crores down from 829 Crores. Interest expense increased to certain extent because of payment of earlier ECBs & some IndAS adjustment. Interest income which was 234 Crores last year has come down to 167 Crores. Lease rentals of 100 to 150 Crores are a part of SEZ business itself and are represented as annual guidance asset. At the beginning of year, CAPEX guidance was given about 2500 to 2800 Crores and company might end up saving 100 or 200 Crores. Adani Logistics Limited grew 28% in revenue in quarter 1 FY18, compared to this last time of the year. Adani Logistics continues to improve its share as the single largest private rail operator in terms of volume. At the end of year steady state, 12% EBITDA margins can be taken for logistics business. Adani continues to pursue our strategy of diversifying cargo mix, thereby reducing dependence on any single type of cargo. Logistics volume consists of 35% EXIM and 65% domestic. In quarter one of FY18; while coal volumes remain static at 16 million ton, Company’s other bulk cargo excluding coal increased by 12% and container volume increased by 21%. In quarter one of FY17, coal which was 37% of company’s cargo mix is now 35%, containers which earlier constituted 35% is now 41%. Other cargo including crude now constitutes 24% of cargo. Dwelling more on container growth, APSEZ handles more than 1.22 million TEUs of the container, its share of container volume in India has now increased from 31% to 33%. APSEZ is confident of achieving guided cargo volume growth of 12% to 14% given at the start of the financial year. In terms of coal, APSEZ has take-or-pay arrangements with TATA. The company had a little less coal due to cyclone situation in Australia but ramp up is visible in this segment. SFI on export is generally 35 Crores in one quarter. Adani’s cargo volume are less because of HMEL, a key customer at Mundra port had shut-down their operations of dedicated facility for scheduled maintenance for more than 60 days which, in turn, company’s crude volume by almost 2 million ton. With HMEL now being operational, Company will be able to cover this temporary shortfall in the remaining three quarters. HMEL is also in the process of increasing capacity by a further 2 million ton which will reflect in cargo volume in the next 2 years. Lines added by APSEZ in Q1FY18-At Mundra IMEX, IMAD and Misawa were added and at Hazira IMEX and IMAD were added. Coming to volume growth at APSEZ’s large ports, Mundra grew by 5% and Hazira grew by 19%. While container volumes at Mundra grew by 20%, coal volumes grew by 6% and other bulk cargo grew by 8%. The company is also in talks with the reputed PSU for handling coking coal at Dhamra with MGT of 7 million ton. Recently the company has signed several long-term contracts. To name a few with JSW Cement for handling blinker with the minimum volume of 1.2 million ton at Dhamra, with HPCL at Mundra for increased throughput from 5 million ton to 8 million ton and with Tata Steel at Dhamra for handling steel coil amongst other. Kattupalli port grew by 30%. In fact, in May 2017, Kattupalli handled container volume of 42,000 TEUs in a month. 30-35% volume growth is expected at Kattupalli this year. Dhamra registered a flat growth as one of the berths was shut for expansion for 23 days. It is expected that volumes Dhamra port will grow by 20-25% in FY18. Dahej port has also seen a remarkable transformation after de-growth in FY17, APSEZ turned around the port to achieve a growth of 3%. In quarter 1 of FY18, Dahej port started handling fertilizer and Agricultural products. For Kattupalli port, APSEZ has taken over operations in November 2015 and ever since thecompany has been billing to customers directly and receiving revenues directly. Dharma port was shut down for 23 days due to some necessary infrastructural alterations but there won’t be any further disruptions this year in terms of cargo growth. CAPEX invested on Kattupalli is about 30 Crores overall. The total outlay of Dhamra is about 800 Crores. With 24 operational rail volumes during the period increased by 69% from 34,000 to 58,000 TEU's. Similarly, Logistics segment handled the terminal volume of 74,230 TEU's which is an increase of 14% compared to the same time last year. The increase in rail volume in on account of the debt started in new ICD. Also, large traffic from north India diverted to Mundra is responsible for increasing rail volume. Mundra International Container Terminal that is incorporated because Adani is in talks with another shipping line for doing a similar joint venture as CT4 and CT3. The gross of about 500 is what we likely to spend the entire year on Vizhinjam. In Hazira in Q1FY18, APSEZ has handled almost 1.3 million tons of coal and almost 110,000 TEUs that is a container which is translating about 1.6 million tons in terms of tonnage and then the company has also handled liquid, it is about 0.6 million ton that is 600,000 tons.